The Laser Interferometer Space Antenna (LISA) mission, aimed at detecting gravitational waves in space, has been approved by the European Space Agency at a meeting of its Science Programme Committee. After many years of development and delays, the mission is now scheduled to go ahead in 2034. 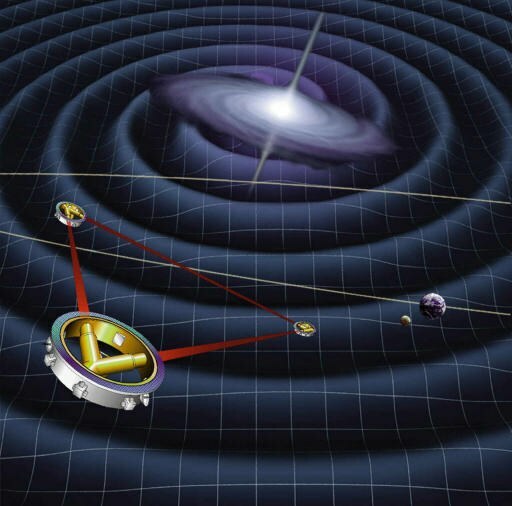 Gravitational waves are ripples in space-time caused by the movement of very massive objects, such as black holes. Originally predicted in the early 20th century by Albert Einstein, they were not detected until 2015, when the Laser Interferometer Gravitational-wave Observatory (LIGO) in the US identified a signal caused by two black holes spiralling towards each other and merging; it has since detected two other similar events. The LISA mission will create a space-based observatory many times larger than LIGO. It will send three identical spacecraft into an orbit following the Earth’s path around the sun; the craft will fly in an equilateral triangle formation, with each side 2. 5 million km long and measured by lasers. The craft will be kept on station using thrusters which control the position extremely precisely using a neutral gas as fuel; this will ensure that their position relative to each other does not change unless a gravitational wave passes through their location. 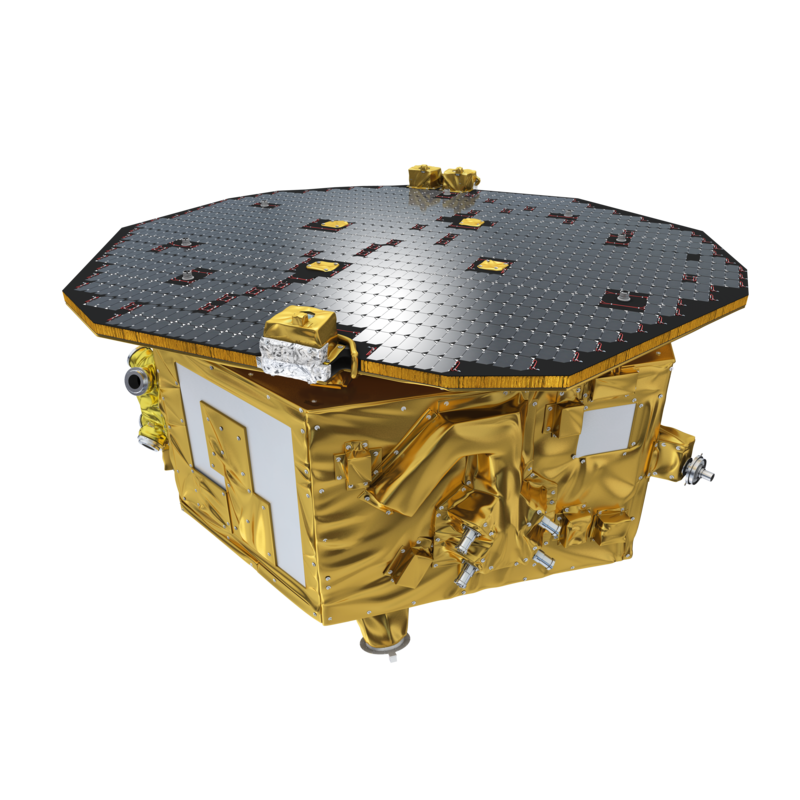 This would only move them by a very small amount of the order of picometres, but measurement equipment whose precision was proven by the LISA Pathfinder mission which is soon to come to an end will detect their movement. Because of the immense distance between the three craft, LISA will be much more sensitive than LIGO, and ESA hopes it will be able to detect the merging of supermassive black holes millions of times larger, but much further away than the events detected by LIGO. Each spacecraft will also carry an optical bench, onto which will be mounted containers for identical precious metal cubes that will float freely in the absence of gravity and rule out any movement caused by radiation pressure, solar wind or micro-meteorites. This technology was also tested on LISA Pathfinder. Because supermassive black holes move much more slowly than smaller ones, it is hoped that LISA will be able to detect their merger months before it happens, allowing other telescopes to be trained on the event. The committee’s approval of the mission will trigger design and costing studies, as well as industrial studies on the best way to build the three spacecraft. In the same meeting, another mission, called PLATO (Planetary transits and orbits of stars) — an orbital observatory designed to detect fluctuations in the light from stars caused by planets orbiting in front of them — was moved on from a blueprint stage to its next phase, which will see satellite manufacturers bidding to build the spacecraft. PLATO, scheduled for launch in 2026, will concentrate on finding rocky planets orbiting stars similar to our sun at a distance that would allow liquid water to exist on the surface; conditions believed to be essential for the evolution of life.